POWER IS! TODD KEENE, The president of The Power Team. Since becoming president in 2003, Todd has led and refocused the team to its original call of sharing the good news of the gospel, building relationships, and walking in integrity. Todd stands 6'5" and weighs 240 pounds. As an All-American football player, Todd played football for the NCAA national champion Miami Hurricanes under Coach Jimmy Johnson and then had a brief experience with the NFL. 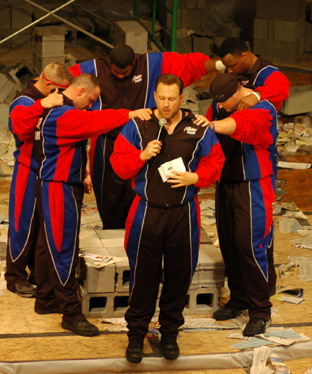 Todd is The Power Team all-time record-holder for crushing concrete bricks with his bare arms. 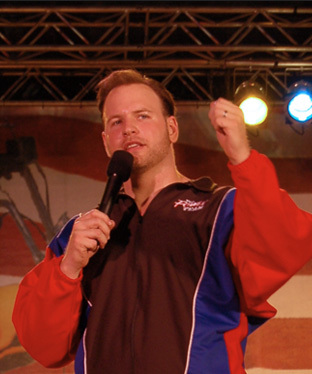 As The Power Team President, a veteran team leader, and as an excellent motivator, Todd continues to inspire crowds around the world as he leads The Power Team into the 21st Century!